What if you could safeguard your company’s production environments without the expense and management of replicating workloads to a secondary disaster recovery site? 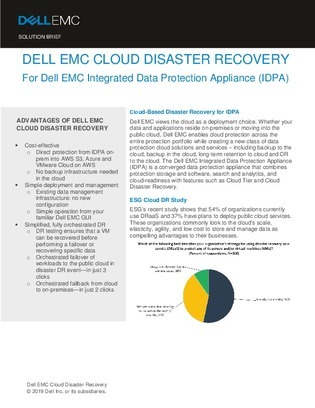 Cloud disaster recovery offers one means of improving operational efficiency, resiliency, and scalability with minimal cost and resources in the event of a disaster or unplanned downtime. And an overview of Dell EMC’s cloud DR portfolio.